The bells at St. Peter Cathedral in Erie rang in celebration of the 125th annivesary of the cathedral on Aug. 2. The mother church of the Diocese of Erie was dedicated in August 1893 during a two-day celebration that featured a procession of 4,500 children from throughout the diocese and a candlit procession of 7,000 adults, according to "Cathedral in the Wilderness," a history of the diocese by Father Robert G. Barcio. Since then much has changed. But one very imporant has stayed constant, said Father Michael Ferrick, rector of St. Peter Catehdral. 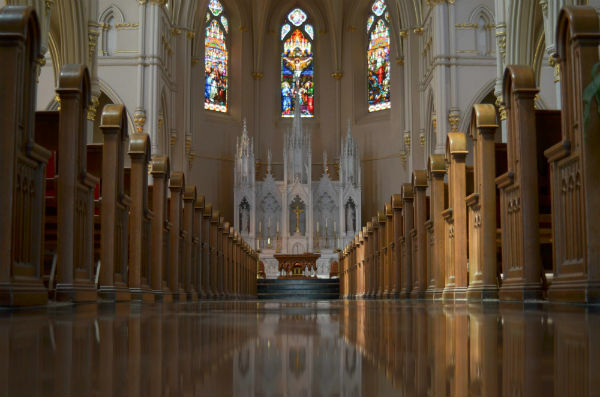 "Think of how many people have walked down this aisle and entered into the sacrament of marriage, how many people have entered Sunday after Sunday to worship here, how many men have been ordained to the priesthood ... how many children have been baptised in this church," Father Ferrick said. "One hundred and twenty-five years. A lot of things have happened, but thing that has stayed constant throughout the 125 years is the faith of the people."